Jamey Stillings was recently honored with a solo exhibition at the 2017 Pingyao International Photography Festival, one of China’s most influential festivals held annually in Pingyao, a UNESCO world heritage site in north central China. Stillings was in attendance for the opening festivities. The theme of this year’s festival was “original inspiration; a brighter future”. 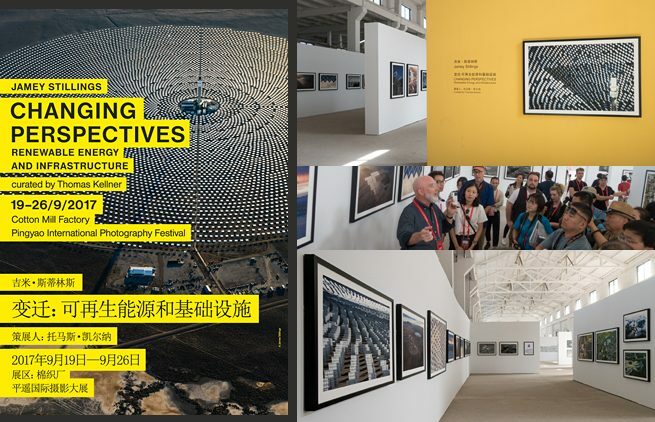 Stillings’ exhibition’s thirty aerial photographs were drawn from several of his projects: The Bridge at Hoover Dam, The Evolution of Ivanpah Solar and Changing Perspectives, with works created in the USA, Japan and Uruguay. The exhibition ran from September 19-26, 2017. Last year’s exhibition attendance was almost a quarter of a million people. Some 50 professional institutions, 60 colleges from China and abroad, and more than 2,000 photographers from some 30 countries and regions, including Russia, the United States and New Zealand, joined in China’s biggest photography event.